From 31st January, Nectar cardholders will be able to collect two points for every pound spent with Photobox, Europe’s leading online photo printing company. Customers can collect points when shopping via the Photobox website, while making Retro Prints, Photo Books, Canvases and other personalised gifts. Offering customers the chance to snap up even more points, Photobox will regularly offer bonus Nectar points through exclusive codes, to unlock additional points at checkout. To begin collecting points with Photobox, shoppers simply need a Nectar card / account and a free photobox.co.uk account which should be linked together. Customers can link their accounts by visiting Photobox.co.uk and following a few simple steps. Customers that link their accounts between 15 Februaryand 19 March 2017 will be entered into the Nectar Million Points Draw, which will see one lucky winner receive one million Nectar points (worth at least £5,000) and 50 runners up will also scoop £50 to spend with Photobox. 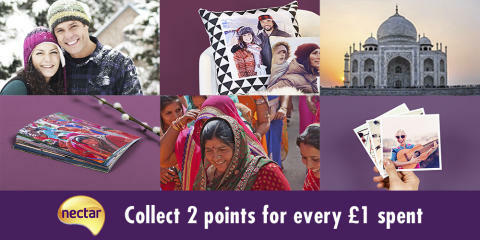 As well as collecting points, Nectar cardholders can continue to spend their points with Photobox by visiting nectar.com and exchanging points (where 500 points = £3) for vouchers. Photobox customers who are not currently Nectar cardholders can request a card at nectar.com. For more information and other exciting ways to receive personal rewards visit nectar.com or download the Nectar mobile app.